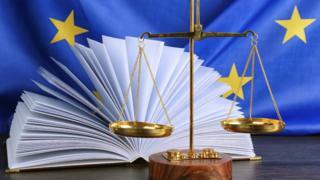 EU nationals who become British citizens do not lose the right to bring a foreign-born spouse to the UK, the European Court of Justice has ruled. London's High Court referred the case of an Algerian man, who lived in the UK with his wife, but who British authorities were trying to deport. His wife had dual Spanish and British nationality, which gave the man a "derived" residence right, judges said. The government said it was reviewing the ruling and considering its impact. The Home Office had argued that once she became a British citizen, Spanish-born Perla Nerea García Ormazabal became subject to UK immigration rules, rather than the freedom of movement directive which applies to EU nationals. That change, officials said, meant she should be treated like any other British national who would have to go through strict immigration procedures - in place since 2012 - to assess whether her husband qualified to be in the UK. Under those procedures, British citizens must earn more than £18,600 ($23,140) before a spouse from outside the European Economic Area (EEA) can settle in the UK. However, on Tuesday, the ECJ ruled that Ms Ormazabal retained the right, under EU law, to a family life, and specifically, to have her husband live with her even if he was from a third country. BBC Europe correspondent Damian Grammaticas says the ruling only applies to European citizens who have exercised their right to move within the EU and have family rights linked to that move. How it might affect EU citizens living in the UK after Brexit - and their ability to have foreign-born spouses live with them - is not yet clear, our correspondent added. Spanish-born Perla Nerea García Ormazabal became a British citizen in 2009 and in 2014, married her Algerian partner Toufik Lounes. Mr Lounes had entered the UK in 2010 on a six-month visitor visa and then overstayed illegally. Following their marriage, he applied for a residence card as a family member of a European Economic Area national. The Home Office refused the application on the basis that under UK legislation, Ms Ormazabal had ceased to be an EEA national after she gained British citizenship. The EEA countries are made up of all those in the EU, as well as Liechtenstein and Norway. Mr Lounes's case was referred to the European Court of Justice by the High Court in England and Wales after it expressed doubts about the Home Office's decision. The European Court of Justice concluded that people in Ms Ormazabal's situation should have the right to build a family life with a spouse from a non-EU country. The salary rule for British citizens was challenged in the UK Supreme Court earlier this year, with families arguing that the rules breached their human right to a family life. Judges, however, ruled it was lawful "in principle".